Ozaukee County Transit Services, 262-238-8108. Fares are based upon a one-way trip. Prepaid punch cards available upon request. One child age 5 and under rides FREE when accompanied by an adult. Any additional children ride at the student rate. The date you will need a taxi. The time of day you wish to be picked up. Please remember that this is NOT your appointment time. This is the time you want to be picked up. Please advise if there is an appointment time. Please check with the dispatcher for pick-up time the day before the ride. Medical facilities will not allow Shared-Ride to pick up a patient after sedation. Please remember that we are a “Shared-Ride Taxi” service, and therefore, you must allow adequate travel time to and from appointments and allow for short delays, as others are scheduled to ride with you. Every attempt will be made to get you to your destination on time. Your taxi will arrive as close as possible to your scheduled pick-up time. 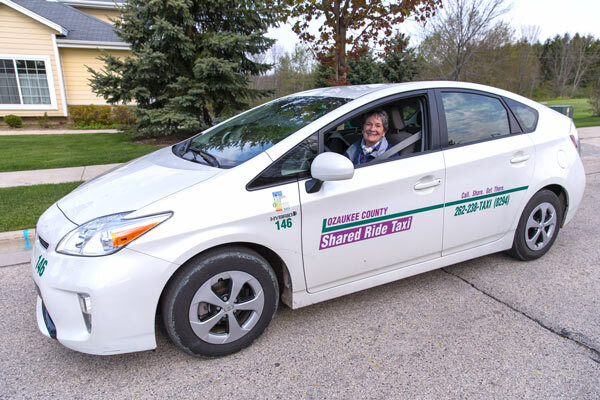 The Ozaukee County Shared-Ride Taxi Service is a public transportation program established by Ozaukee County and is operated under County Authority. Trips using the taxi service should be arranged in advance. The Shared-Ride Taxi Service uses sedans and wheelchair-accessible vans. If you specifically need a wheelchair-accessible van, please make this request at the time of your call. All passengers must wear their seat belts at all times. All children under 4 or 40 lbs must be seated in a secured child safety seat, and all 4-8 years olds that are between 40-80 lbs must be in a child safety seat or booster seat provided by the passenger. Passenger Behavior – All Ozaukee County Shared-Ride passengers are to act and behave appropriately while utilizing taxi services. Ozaukee County Transit Services has zero tolerance for inappropriate behavior. If a passenger becomes offensive, threatens others or is otherwise disorderly, Ozaukee County shall have the right to suspend service or impose other disciplinary actions for an individual for a given amount of time, up to and including permanent suspension from use of the Ozaukee County Shared-Ride Taxi. Determination of the nature of the disciplinary action or on the length of time suspended shall be made by the Transit Director as deemed appropriate. All passengers must be ready and waiting for pick-up. If you are being picked up from a public building or health care facility, including a nursing home, you must be waiting in the lobby. Taxi operators will go no further than the lobby of a building for pick-up or drop-off. The taxi operator will wait up to three minutes. The taxi is not able to accommodate any drive-through requests. Eating, drinking or smoking is prohibited in the taxi. Please cancel any services that are no longer needed at least one hour in advance. In the event of a “no-show,” all services for that day will be refused. “No-show” fine will be collected at the next scheduled trip. Service cannot be provided in areas where driveways or roads have not been cleared of snow. 24-hour notice for Washington County transfer. We strongly encourage 24-hour advanced notice for all rides to ensure taxi availability for your trip, and require 24-hour advanced notice for all transfers to Washington County Taxi in Newburg. Only ADA service animals allowed on board. No Pets! Please advise dispatch of any special pickup instructions. A limit of (2) grocery bags or parcels that would fit on a customer’s lap are allowed on board per trip, to allow space for a maximum number of passengers. Zone F: Bordered by River Park Road and Meadowlark Road on the south, the county line on the West and North, and Highway Kay-K on the East. Zone E: Bordered by Dixie Road and Highway P on the South, the county line on the North, and Highway Kay-K on the west. Zone D: Bordered by Cedar Sauk Road on the South, the county line on the West, Highway I on the East and River Park Road on the North. Zone C: Bordered by Cedar Sauk Road on the South, Highway I on the West and Dixie Road and Meadowlark Road on the North. Zone B: Bordered by Pioneer Road (Highway C) on the south and Cedar Sauk Road on the North. Zone A: Bordered by County Line Road on the South and Pioneer Road (Highway C) on the North.